Jeremy W. asks: Is it true that drinking tea made from twice boiled water is bad for you? When we boil water, the chemistry of it changes, which is usually a good thing as it boils out volatile compounds and dissolves gases. This is why boiling water mostly ensures that it’s safe to drink. If water is left boiled too long or is reboiled, the chemical compounds change for the worst. By leaving your water to boil down, you’re actually concentrating many harmful chemicals instead of getting rid of them. The same thing happens when you reboil water, as the compounds concentrate and increase the risk of ingesting certain chemicals. So is it true that drinking reboiled water is bad for you? In short- nope, at least not so long as your water is reasonably safe to drink in the first place and you aren’t the victim of some wildly unrealistic scenario. Don’t believe me? Read on! As we’ve already talked about in our article on why some ice cubes are cloudy and others are clear, the kind of water that pours freely from all of our faucets contains innumerable impurities, some of which are, at least from a practical standpoint for most home consumers, impossible to filter out entirely, such as nitrates. However, the concentration of these impurities is not generally particularly harmful in the normally negligible quantities you’d find in common tap water. So unless you currently happen to live in one of those place in where the tap water catches fire or contains approximately the same concentration of lead as pure lead, for the most part your drinking water is probably pretty safe as is. This brings us to the chief argument generally leveled against twice boiled water- concentration of impurities. When some of the water evaporates as the water boils, while some impurities are removed, others remain (called non-volatile substances) and are now more concentrated than when the volume of liquid was greater. This is absolutely true. So, case closed right? Twice boiled water is definitely bad for you… Except, this water is actually still not bad for you, unless it was already bad for you to begin with (i.e. you have pre-existing problems with your drinking water supply). Why? Aside from the fact that you aren’t likely letting the water boil down significantly before brewing your cuppa (in fact, many don’t even bring the water to full boil before turning off the heat and pouring), even if you did, it wouldn’t matter except for in outlandishly unrealistic scenarios. You see, if you drank the entire teapot worth of water straight- say five mugs worth- rather than boiling it at all, it would not have hurt you and would have contained more impurities than the same full teapot boiled down to one mug worth of water, as the impurities that would have been otherwise boiled off would still be present in the original five mugs of water. The key point here is that boiling the water does not add any impurities, it actually subtracts some. So whether five mugs worth of unboiled water or one mug from five boiled down, you still have mostly the same amount of impurities. The only real difference here is you’ll be more hydrated if you’d drank the five mugs. Now, potentially if you were always doing this, and using tea as your primary hydration source, continually getting five times the impurities for one mug of water may be an issue, depending on the purity of your water source… except even the biggest of tea drinkers aren’t boiling off anywhere close to this amount of water when making tea, and the more tea you drink, the less will be evaporated off in between. But what about the state of the water the second time you boil it? Couldn’t there be impurities being added in between? While it is possible a kettle without a lid left sitting on the stove or counter might get a bit of dust or the like in the previously boiled water, the composition of it isn’t likely to change much in the interim between boiling, outside of scenarios like a construction site or something. In most office buildings or your home, this isn’t going to be an issue, and even less so if your kettle has a lid. Any microbes that find their way in there would also be killed off during the subsequent boiling process, so no health issue there either. The only potential problem area left then would be the water picking up something from the kettle itself. But studies have shown that, while things like iron and nickel and the like do leach into foods in exceptionally small quantities while you heat them in something like a stainless steel container, this is not so much the case when discussing leaching into tap water alone, particularly if you’ve used the container several times before (i.e. it’s not new). Unsurprisingly most kettles are made from extremely non-reactive substances (at least to tap water). Because of this, whether you boil the water once or several times, any impurities picked up from your kettle should be negligible in the vast majority of cases. If they’re not, that’s an issue with a faulty kettle and is likely an issue with once boiling as well. Easy solution- get a better kettle. That said, if you brewed the tea in, for instance, the stainless steel kettle itself rather than your mug, then boil and let it sit, there will be some leaching similar to when cooking certain food items (with your mileage varying depending on what exactly the kettle is made from and what you’re putting into the tea) . But when discussing using that brewed water later for re-boiling and brewing again, this once again gets into the realm of “nobody does that”, and certainly isn’t the scenario people are talking about when discussing that it is “bad” to use twice boiled water. This is not to mention that impurities picked up from the kettle aren’t necessarily inherently bad for you at the quantities they may be leaching in this unlikely scenario (whether double concentration from twice boiling or single from once), and some might be good for you, such as if you’re low on iron and getting leached iron from the kettle. In the end, there’s a reason not a single public health agency in the world advises against drinking twice boiled water. Outside of elaborate scenarios that nobody actually does, kettles that are dangerous to boil water in even once, or water that already has unsafe levels of some compound, twice or thrice boiled water isn’t going to cause you any harm. Another argument often leveled against the idea of using twice boiled water in tea is that it supposedly affects the taste. Now as a Brit, I can tell you that some people take making tea very seriously and feel there is a genuine art to making a good cup. However, the idea of what exactly constitutes a “good” cup of tea, like your favourite Power Ranger, varies dramatically from person to person. I’m personally quite partial to “builders tea” (and the Green Ranger). Builders tea is a colloquial term used to refer to tea that is strong, milky and loaded with sugar- all things “real” tea drinkers would consider an affront to their very sense of being. Likewise, I know of others who turn their noses up at anything less than the finest Lapsang souchong filtered through the silken robes of a well-toned Shaolin monk. Needless to say, when discussing what is better tasting tea or not, “science” and “what George Orwell think” have little to no bearing- you like what you like. This brings us back to twice boiling tea and that it purportedly “ruins” the taste of the tea. Beyond the subjectivity of such a statement, the funny thing is, it’s not actually clear twice boiling water does affect the taste of tea. While, as we mentioned, in an extreme case of doing something crazy like boiling down twenty liters of water to a single cup’s worth will indisputably drastically affect the taste of the tea due to concentration of impurities, when talking about a more realistic scenario of something like twice or thrice boiled water that barely has any of it evaporated off at all in between (and generally fresh water added before each boiling, diluting the mixture), it’s not so clear there is a difference in taste happening, other than perhaps in peoples’ heads. 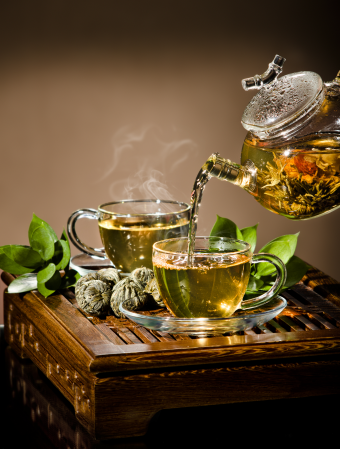 While I could not find any studies on the idea of twice boiled water changing the taste of tea, we can at least look at the mechanism involved to get an idea on whether it is likely or not that such a taste shift is occurring. For starters, many claim the taste difference comes about due to twice boiled water having less dissolved oxygen in it, referencing the fact that, as the water temperature increases, the solubility of oxygen decreases. This latter fact is absolutely true. The former is not. You see, at 100˚C (boiling point) the concentration of dissolved oxygen (assuming normal atmospheric pressure) will ultimately be near zero, whether it’s once or tenth boiled water. How long you boil the water does come into play somewhat, but even then the differences are minimal, with dissolved oxygen levels at 1 atmosphere and 0°C on the order of 15 ppm, compared to approximately 5 ppm at 50°C and near 0 ppm at 100°C. “But my tea tasting palate is extremely refined and able to detect even the smallest of changes of dissolved oxygen levels,” you say as you idly clean your monocle. Once the water is allowed to cool back down, its dissolved oxygen levels will once again begin to rise to normal levels given atmospheric pressure and temperature. (CO2 levels, which can affect the taste, will also return to normal.) Given this, the second time you bring the water back up to boil, things like the oxygen level are not going to be any different than the first, assuming equal boiling times and/or temperature levels. That’s not to mention that the idea that more oxygen = better tasting gets into the aforementioned debate on what does or does not taste better when making tea- everyone’s got their own preferences. And if you’re curious, there have been studies (Pangborn & Bertolero 1972, Faust & Aly 1998) that have indicated that dissolved oxygen actually doesn’t noticeably impact the flavour of water, though it should be noted that those studies weren’t dealing with brewing tea, and it is possible (even probable) that dissolved oxygen could be interacting with elements of the tea to change the flavour (similar to what happens with wine). But either way, whether once, twice, or thrice boiled, you’re getting essentially the same dissolved oxygen levels, assuming you boil/steep the same way each time. Another factor in twice boiled water that may affect the flavour is higher concentration of impurities, which, as we already discussed, in realistic tea making scenarios isn’t actually going to be much different than once boiled water. The only thing left would be the water picking up something from the kettle itself that affects the flavour, but, again as previously mentioned, studies have shown that, while things like iron and nickel and the like do leach into foods in exceptionally small quantities while you heat them in something like a stainless steel container, this is not so much the case when discussing leaching in water alone. The bottom line on all of this is that, whatever your position on whether twice boiled water does or does not affect the taste of tea and, if so, if it makes it taste better or worse to you, widespread claims, even from otherwise reputable sources, that seem to imply twice boiled water will somehow give even cancer, cancer are not correct. Twice boiled water simply isn’t bad for you at all unless your particular water source was already bad for you at the once boiled level. Is Twice Boiled Water Dangerous? As an enthusiastic tea drinker, I enjoyed this article. Where I live (in Canada) the water has a lot of dissolved minerals so that our electric kettle gets quite a build up, even though we only use filtered water for tea. I’m not the least bit worried about it, though. The minerals are probably healthy. One way around this issue is using bottled distilled water, which I use sometimes, and I do find it makes a “cleaner” tasting cup of tea. But I’m not really worried about it. By the way, I am drinking a tall mug of tea while typing this…lol. I’ve always had a vague sense that water shouldn’t be boiled twice, probably inculcated in me by my English grandmother. I never looked at the thought critically until it came up while I was making tea for my husband. He scoffed, and I forgot to research the idea further. Now I just need to know why when I make iced tea, it sometimes gets cloudy, even though I use the same water source. My husband insists the cloudiness ruins the taste. I’d like to scoff at him, but I’ve begun to taste the difference. Brainwashing? Perhaps. I’m sure I’ll find the answer on your site! From what I understand, iced tea gets cloudy when it’s cooled too quickly; that leads to some of it precipitating out of the tea/water solution. It’s still perfectly fine to drink, though! What are the hazards of re-heating a cup of tea or coffee using a microwave besides the taste? I only drink about two or three cups in the morning and two before work at night and I do not like to waste a half a pot of coffee because I do not drink the whole pot of coffee at once. Microwaves remove essential vitamins from food, epically vit. B. @Kelli: Interestingly, cooking on the stove also sometimes does the same thing. For instance, microwaves convert Vitamin B12 to an inactive form, which means about 30-40% of the Vitamin B12 in microwaved foods is not usable by mammals. One thing this article doesn’t mention is what happens when you microwave water to boiling twice in the same cup… When you boil it for the second time, the water is much more likely to superheat and suddenly partly flash to steam, splashing boiling water all over the inside of your microwave (or you) on the slightest disturbance. If you have especially clean glassware, this is more of a problem, as there are fewer spots where superheated water can start boiling on the surface of the glass. If twice boiling water concentrates the impurities then why do they have reductions in cooking? Seriously, boiling it twice is nothing different than letting it boil down to almost nothing and drinking that water. Any impurities in the water are in the water when you turn on the tap. First and foremost you are supposed to drink lots of water everyday and if that water is bad for you in concentrated amounts then it’s bad for you diluted as well since it’ll all be in your body anyway. If you’re in the civilized world you won’t have any problems to begin with but if you’re still paranoid get a faucet filter like Pur and drink away with no worries. I always use freshly-drawn water, as to me it tastes…well, more tea-y. And as for the milk-in-first thing, that dates from the days when we used teapots. If you pour cold milk into scalding hot tea, the milk separates and, while it may not affect the taste, it’s definitely unappetising. Nowadays we tend to brew the tea in the cup, and the decision is made for us; you can’t brew tea if there’s milk in the cup, it needs to be *boiling* water. That’s boil*ing* water, not boil*ed* water. Twice boiled water in tea – one of my pet peeves. There is a definite taste imparted to tea if our town water has been boiled twice. If I use rain water from our water tanks at home, there is no taste imparted if the water is boiled twice. Can only conclude that there is something different in the town water which is not present in the rain water (i.e. flouride, chlorine or organic matter maybe) which is affected by the heating/cooling/heating process and has a taste once mixed with tea. Don’t believe that there is enough “boiling down” of the water to cause any appreciable change in the concentration of impurities. Agree, twice boiled tap water make the tea taste off. Roommate has a thing about keeping the kettle full so it never boils down without water in it. Umm, it’s my kettle, I’ll be the one cleaning it. Just hate the taste of 2x boiled water to the point I have to even wash out the kettle if it happens. Interesting article, but when you boil something, also known as vaporizing, the substance only undergoes a physical phase change. Ergo, the chemistry doesn’t change at all. Whole lot of writing and didn’t say very much. Interesting. I recently had a conversation about water, dissolved impurities, taste and so forth. My companion maintained that the amount of certain, ahem, elements affect the taste of water. 2 hydrogen atoms. 1 oxygen atom. It matters not the least bit what so called impurities or other additives there are in water. If it’s WATER, then it has 2 hydrogen atoms and 1 oxygen atom. Anything other than that makes it NOT water! Ok. I’m a sarcastic SOB I know. But it’s my soapbox. Comparing 5 cups of water to one cup of water boiled down from 5 is not very useful. It does not address the concerns nor does it reflect any realistic situation. (Of course, the impurities imbibed will be roughly the same). The concern about reboiling water in a kettle relates to the comparison between 5 cups of freshly drawn tap water boiled once per cup, and 5 cups of tap water drawn once and then re-boiled all together minus one cup of water 5 times. The question is: Does the 5-times reboiled 5 cups of water contain more harmful, concentrated impurities (already present in the water or leached from the kettle) compared to the 5 cups of fresh once-boiled water?